The problem with wearing ice cleats around town is having them on your feet when you don’t need them. You can’t walk inside with them. You can’t really drive with them. You are constantly pulling them on and off. Get a load of groceries from the car—put them on; go inside—take them off. Repeat. That’s what makes the Ice Commuter so cool. The design lets you stow the cleats behind your heel when you’re heading inside, or walking long stretches on dry pavement, or driving. It’s the only traction device we’ve seen that lets you go indoors without taking them off. 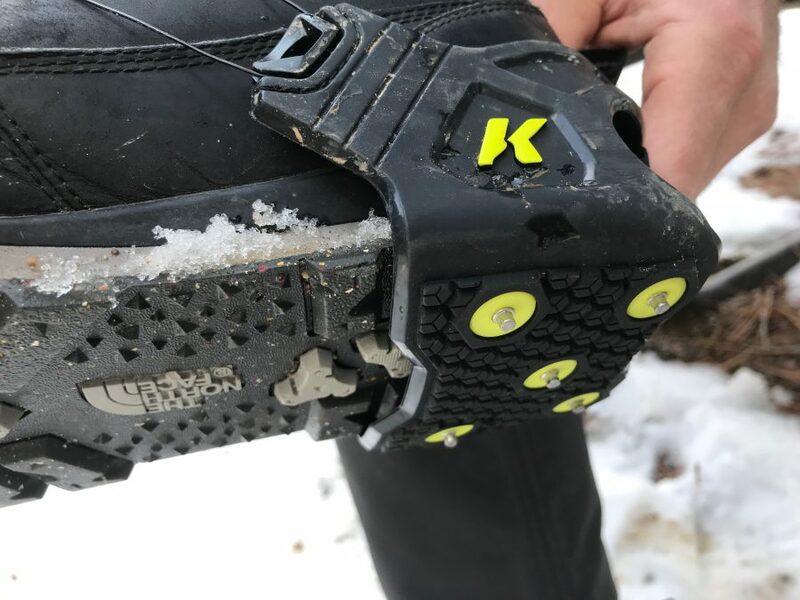 The Ice Commuter uses the third-party BOA closure system to snug onto your shoe and bites into the snow with a set of five replaceable, push-through spikes on each heel. All you have to do when you are heading outside is slip the spiked heel cup over your heel, twist the BOA dial to ratchet them tight, and go sliplessly on your way. When you’re heading inside, you just loosen the BOA closure, slide the heel spikes up behind your heel, and snug the system down again. The spikes nest on the back of your shoe, out of the way–and off your hardwood floors. What’s the BOA closure system? 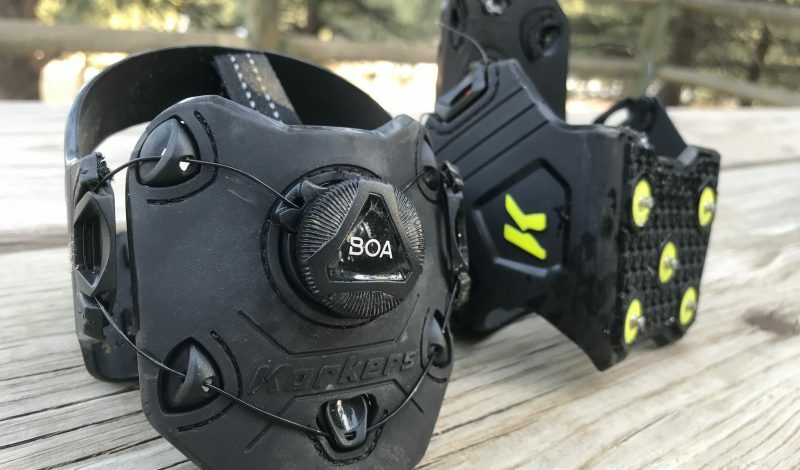 The Ice Commuter is not the first traction device to use BOA, but it is the smartest. The system allows for a glove-free transition between “walk” and “stow” modes—letting you switch over without fussing with straps or buckles. BOA is a popular third-party closure system that has been around since 2001. Strong cables replace laces, ratcheting tight with a few turns of a dial and loosening with a quick pull upwards. You can even work the system with big mittens on. First time buyers often ask whether the system is strong. The cable is thin, but it’s made of 49 individual strands of “high-strength aircraft grade stainless steel” as BOA likes to say, apparently strong enough to lifting 300 pounds. It’s bomber. Why aren’t there spikes in the forefoot? Most ice spikes have cleats in the forefoot and heel for maximum traction. The Ice Commuter eliminates the spikes in the forefoot and midfoot area where they are less important to let the system stow on your heel. It’s not much of a sacrifice. If you are often transitioning between dry and icy pavement, it’s easier not to have spikes in the forefoot. 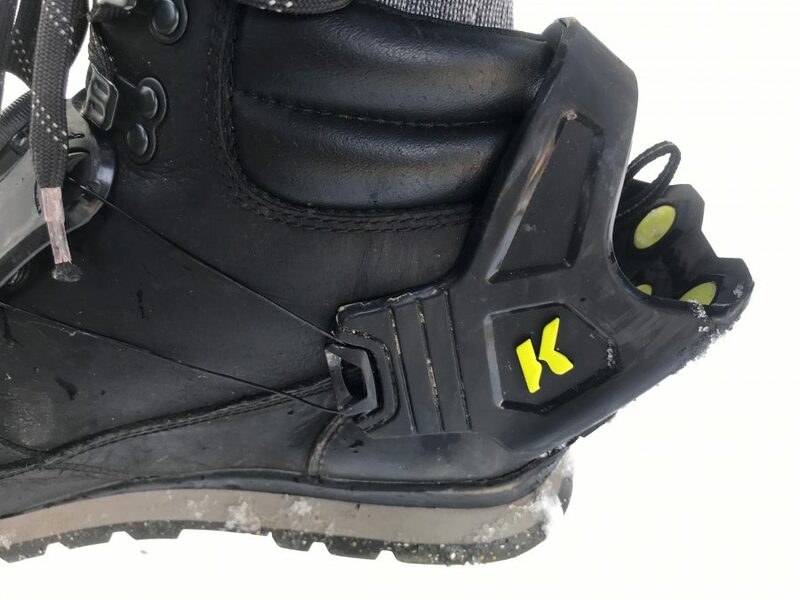 Heel spikes are important to keep you from slipping when your foot first touches down, especially when you step forward down a slope, like down a driveway or icy stairs. Forefoot spikes are more important for pushing off, during the “takeoff” portion of your stride, such as when you are running. You aren’t going to do a lot of running in a heel-only pair of ice cleats, but they are far more practical for daily use. We used the Ice Commuters for icy snow-day commutes in Denver. It’s a really simple system to use. 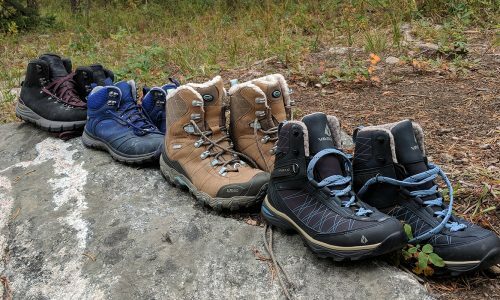 Stowing the system on the back of your heel is easy, and you just need to make sure the system is tightened snugly so the heel doesn’t swivel around or come loose if you bump it on something. Transitioning between ice and dry pavement is no problem. Even wearing gloves, it’s not hard to slip the heel cup under your heel and lock the system in securely. When not in use, they fit nicely in a pocket or in the little travel pouch they come with. Even with just the spikes in the heel, there is adequate traction on ice and packed snow. You just adjust your stride slightly so that you feel your heels dig in before relying on your footplant. 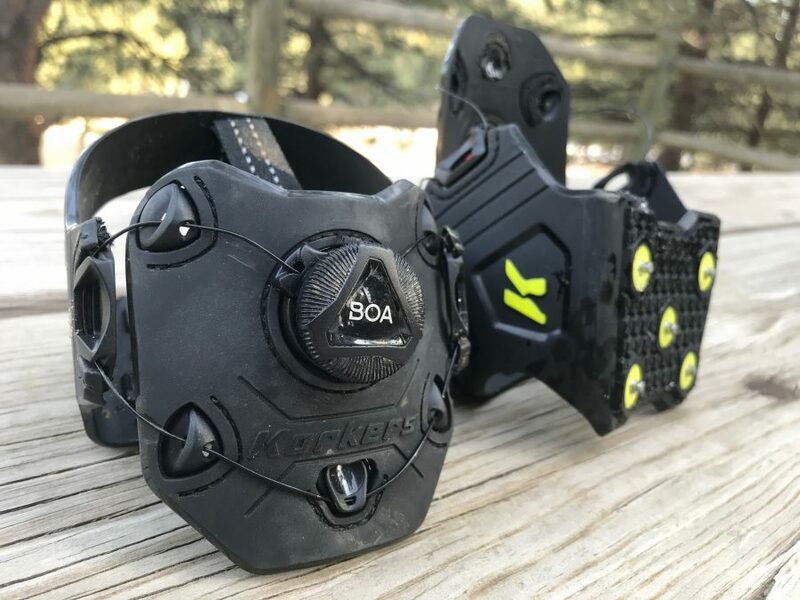 It’s not a system designed for more active pursuits, like running or hiking on steep trails—each of which will require more forefoot traction. 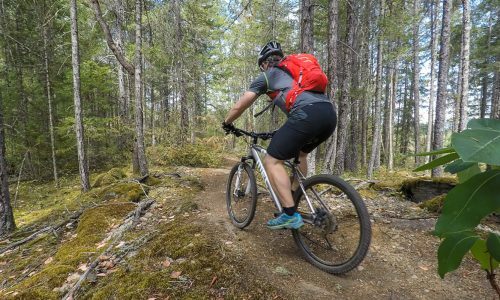 Short hikes on packed trails without a lot of climbing would be fine through. Yes. 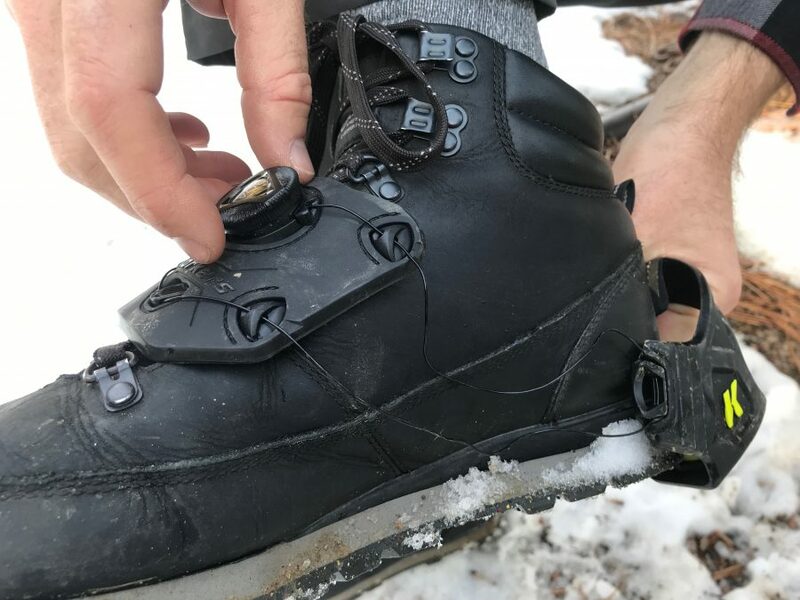 There’s a similar, full-foot BOA traction system for walking and hiking (the 5-ounce Ice Walker). 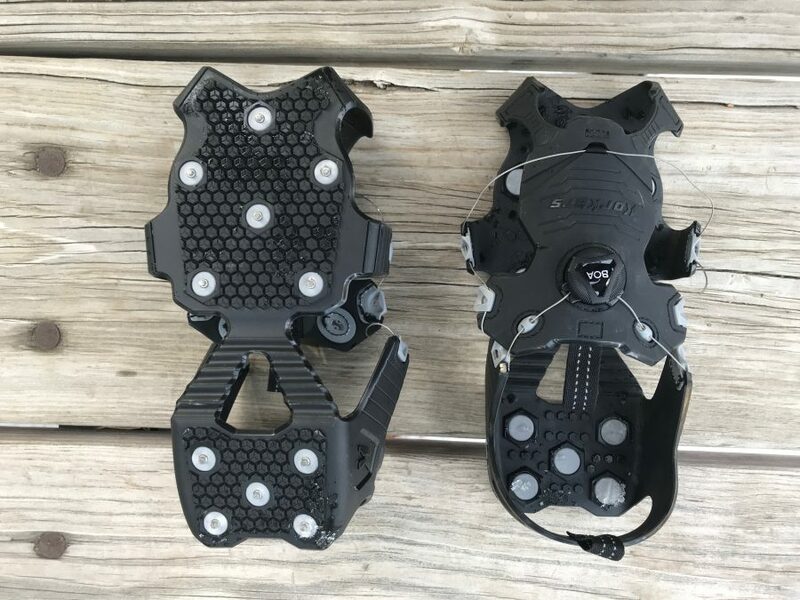 There’s also a similar but lighter version for winter runners called the Ice Runner (which is 4-ounces per cleat). Both offer a fair bit of traction on ice and packed snow, and lock into the foot snugly and confidently. 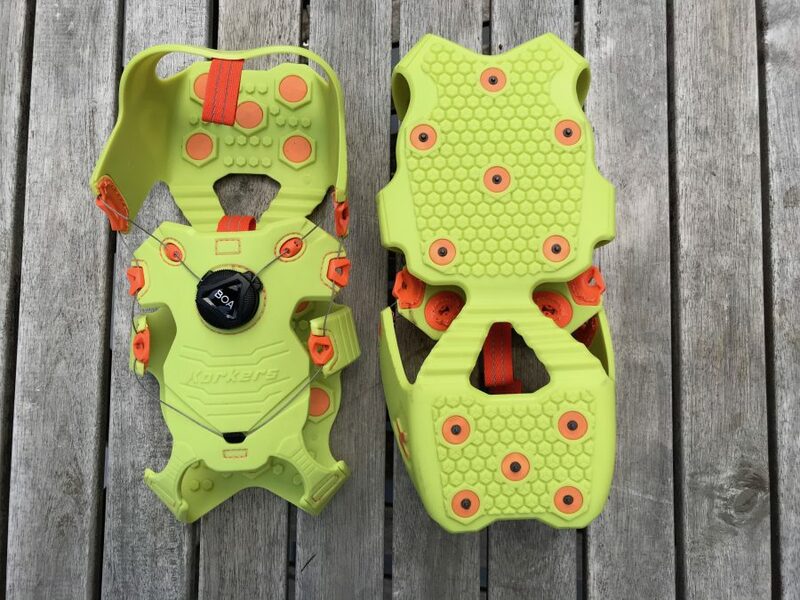 The Ice Runner is a four-ounce, full-foot ice traction device for runners that uses the BOA closure system. 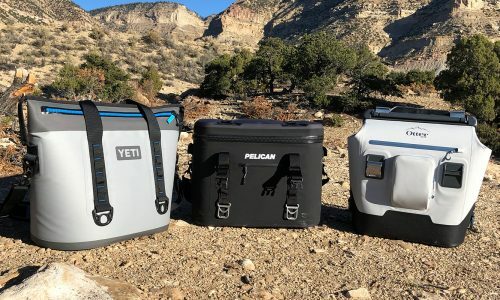 The Ice Walker is a five-ounce version with the same BOA closure system for light hikes. 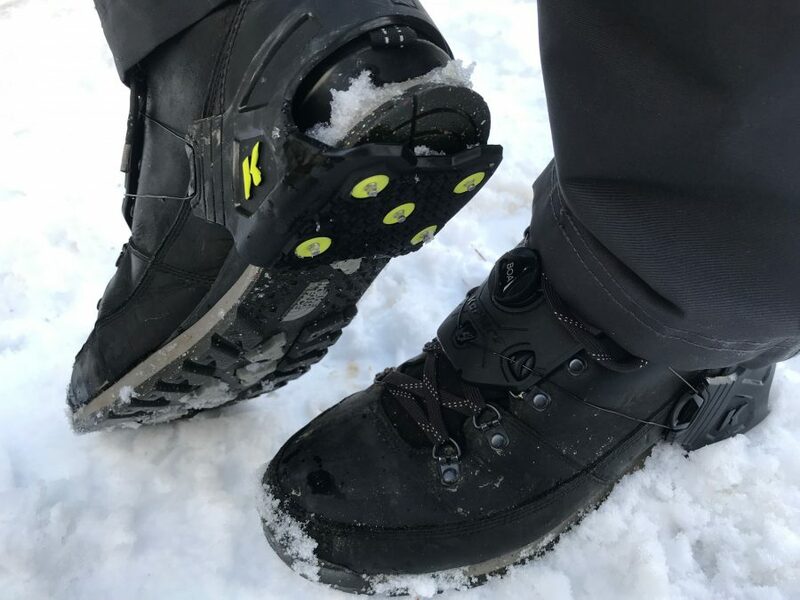 While you can’t stow the full-foot versions on the back of your heel like the Ice Commuter, both have the same advantages of the BOA system–glove friendly on-and-off and a secure fit. They are also low profile enough underfoot that you can wear them on pavement without feeling like you are walking around in crampons.